Joomla Tip/Tutorial: What is Joomla Legacy Mode 1.0 and how to enable it? For sure you have also seen at some point some Joomla modules or components, which are only compatible with Joomla version 1.0. Is there a way to install these extensions on Joomla 1.5? The answer is "yes", but only those which allow this. To make sure this is possible, read first the documentation of the extensions you want to install. 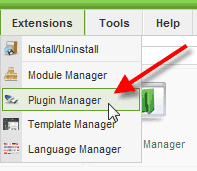 Then you have to activate a plugin, which is part of the default Joomla installation and is normally disabled. In order to activate the Legacy Mode you go at first to your administration Backend of your Website and up on the "Extensions" menu you click on "Plugin Manager". Then at the list of the Joomla plugins you look for the plugin with the name "System - Legacy". You click next to it to check it and so it is enabled. Now on the upper right you can see that Joomla notifies you with red letters that it works in "Legacy: 1.0" mode.